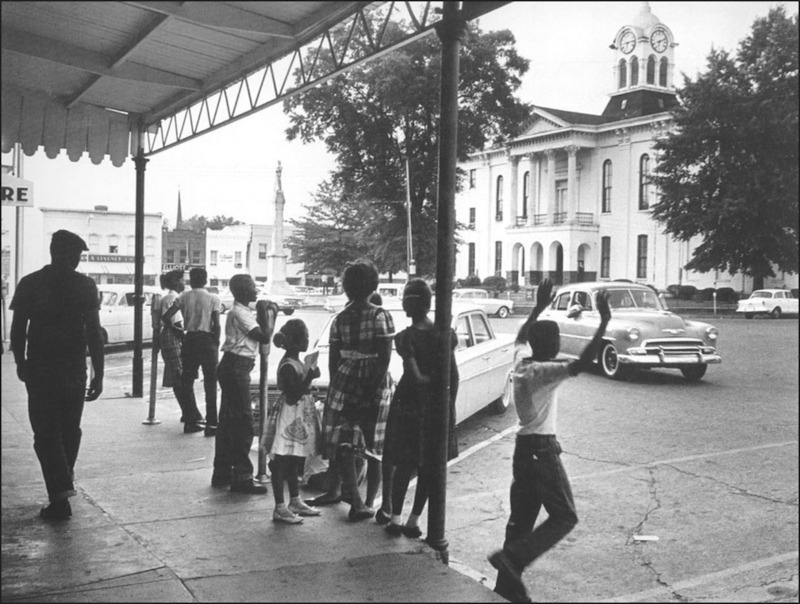 One of the most identifiable public spaces in Mississippi is the courthouse square. Courthouse squares are defined as places located at the center of the original town plan and designated as the location for the county courthouse. The idea for a centrally located courthouse square apparently originated with Scots-Irish immigrants, many of whom were familiar with a central square with a prominent public building from some early seventeenth-century towns the English had laid out in Northern Ireland. Complicating the origins of this town form as it developed in Mississippi was the political significance the Mississippi legislature gave it in the mid-1830s. After the Choctaw and Chickasaw land cessions of the early 1830s, the legislature granted full power to the boards of police (the forerunners of today’s boards of supervisors) to locate the “seats of justice of several of these new counties at the geographical center or the most convenient point within five miles thereof.” Although not all courthouse squares were mandated in this fashion, the idea certainly worked well and was imitated throughout the state. The centralized location of the seat of government was one of the most concrete examples of Jacksonian democracy. Courthouse squares were theoretically located equidistant from citizens in all parts of the county, just as many southern states had placed their capitals in geographically central locations to improve access for all citizens. Block square: The center square of a nine-block grid is the location of the courthouse. The streets bordering the square intersect at right angles. This is the most common type of central courthouse square in Mississippi. Included in this type are Canton, Carrollton, Houston, Kosciusko, Philadelphia, and Ripley. Philadelphia or Lancaster square: The center square is superimposed over the intersection of two roads, with the corner area from each surrounding square taken to form the center square. Each street intersects the central square at the midpoint of a side. Mississippi currently has no squares that follow this pattern. Harrisonburg square: The center square has streets intersecting the midpoint on two flanking sides, with no intersecting streets on the other two sides. In Mississippi, Charleston and Oxford follow this layout. Four-block square: The center square has streets intersecting each of its sides as well as intersecting streets at each corner, meaning that a total of twelve streets enter the square. Hernando and Lexington are two Mississippi examples of this type. The square in Holly Springs is a combination of the Harrisonburg and four-block square plans. The square in Holly Springs is more of a rectangle, with roughly twice the space of the better-known Oxford square. A few county seats have open squares but no courthouse. Some of these, such as Grenada, Calhoun City, and Bruce, have never had courthouses. The open square in Pontotoc resulted from the demolition of the nineteenth-century courthouse, which stood on the square until the 1916 construction of the present courthouse, which faces onto the square. A similar fate befell Brandon in the 1920s, when its 1850s Greek Revival courthouse burned and a newer, larger building was constructed facing the now open square. The courthouse in Natchez is located on the original plaza laid out by the Spanish in the 1790s. As originally designed in typical Spanish Colonial fashion, the plaza was an open area onto which public buildings, most notably the church, would face. However, this arrangement did not last long, and the courthouse was constructed in the middle of the plaza around 1820, thus Americanizing the Spanish plan. Woodville’s square is really a long rectangle that includes the square with the courthouse and a smaller area with the town hall (originally the location of the market house) to the north across Main Street. To the south of the courthouse was a small monument park. In addition, the courthouse occupies an entire city block in many county seats, but this block was never the town’s center square. The land often was donated to the county after the town was established or was purchased by the county when it needed a site for a new courthouse arose. Corinth, for example, was designated as the second district seat of old Tishomingo County in 1859, five years after the town was laid out at the intersection of the Mobile and Ohio and Memphis and Charleston Railroads. That arrangement persisted, with Jacinto as the first judicial district seat, until the county was subdivided in 1870 into Alcorn County, Prentiss County, and a smaller Tishomingo County. Corinth then became the seat of Alcorn County. Other railroad towns laid out on a grid include Tupelo, Cleveland, and Meridian.